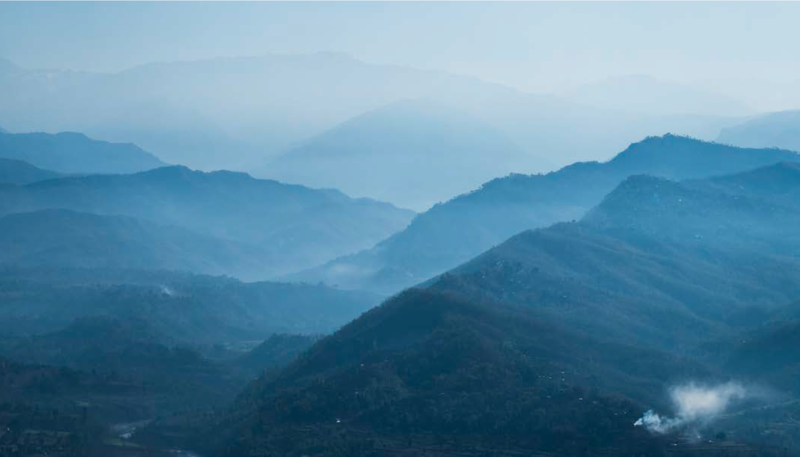 Khadka Gaun is a small community based in Namjung, Gorkha and is west of Kathmandu. 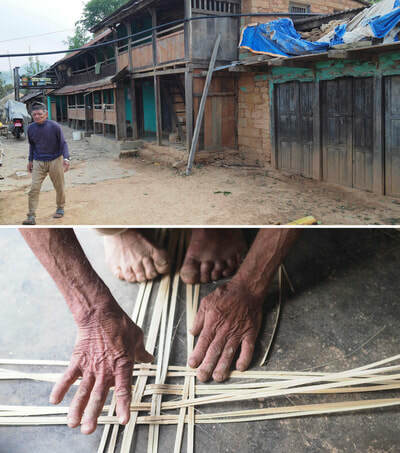 The people in the area were very welcoming interested and accepting of having 12 new people stay in their homes and we enjoyed working together to develop livelihood projects in the area. 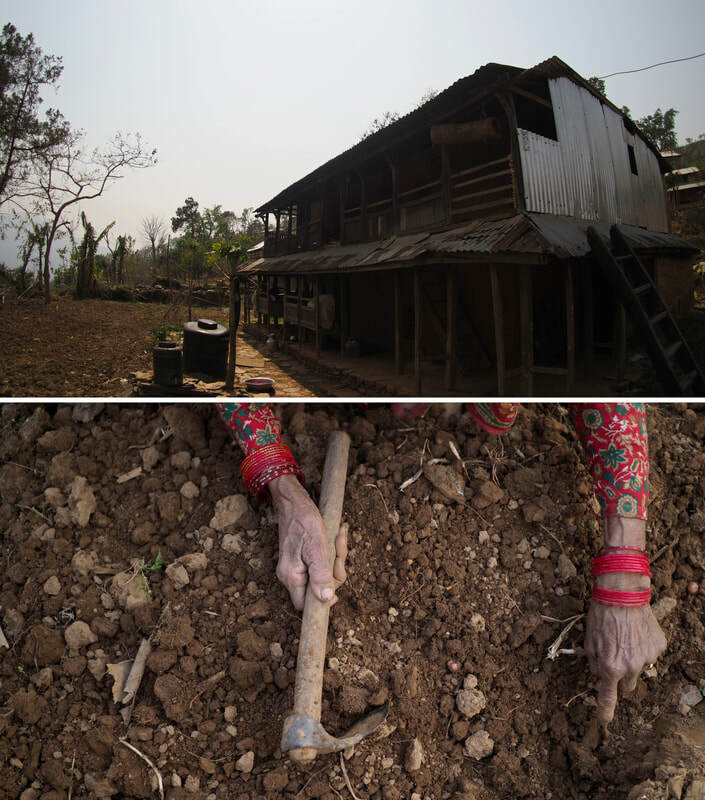 The 2015 earthquake devastated the area and although some people have had financial support, it has not reached everyone yet. Funds from this project will go directly towards generating support for the community through education, training and agriculture through the organisation SSICDC. If you would like to know more about this project or to buy a book/print then please email us at infocus.org. The money fundraised through this goes straight towards the community and environmental causes. Thank you to Olympus and Raleigh International for the support. You can find out more information about the event here. A fire appears in the distance on top of the hills during sunrise from the community. 2017. One of the local dogs takes us on a tour while the clouds come through the community. 2017. Ama is such a genuine, friendly person. We talk to her about her passion for the community. 2017. 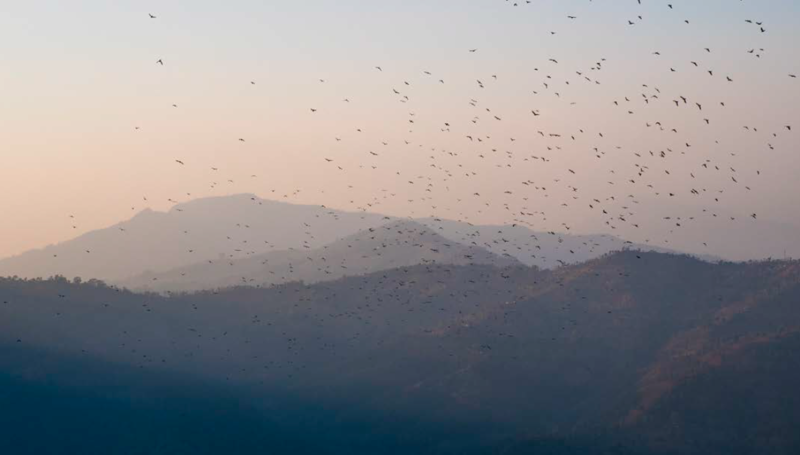 Birds fly into the hills after sunrise. 2017. 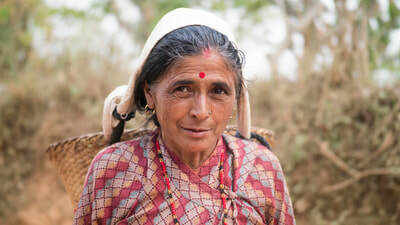 Januka Paneru is a mother of three whom originally came from Dhading district and got married at the age of seventeen and has lived here ever since in a temporary shelter at the top of Khadka Gaun with her husband. 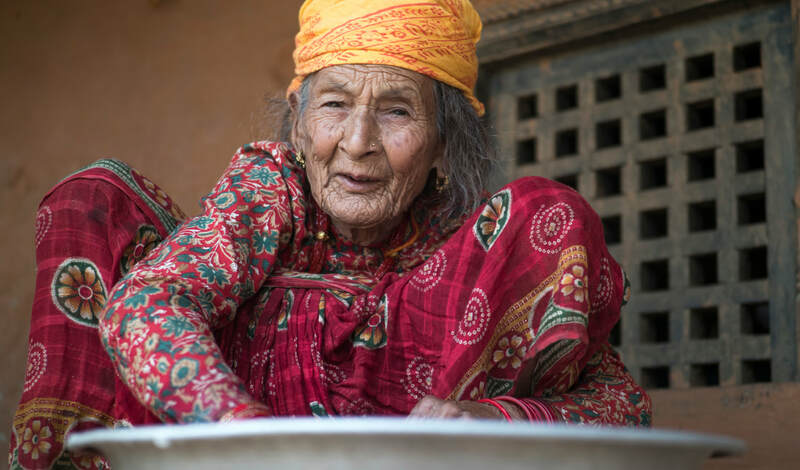 She enjoys traveling to temples, having fun and spending time with her family. While talking to Januka her children were excited to play with us and enjoy dancing and singing. The earthquake in 2015 destroyed her family’s house and they are still living in a temporary shelter two years on. 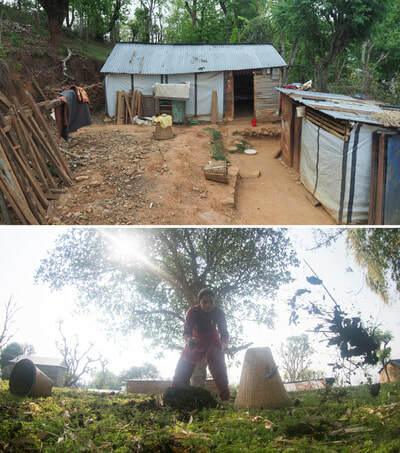 The Nepali army came to save crops and they were given a fund to build a temporary house and are still trying to continue their normal life. As many people did after the devastation, they had to adapt after the natural disaster that displaced thousands and Januka says: “I want to give a better education to my girls because they deserve a good life” explaining her main aim is to give her children a better future. Dhan Bhadur Pariyar (53) lives with his family and is a passionate tailor who loves farming and the environment in Nepal and he choose to work as a tailor because he doesn’t have to work outside and he thinks it’s a good and easy job. When talking about the love for his community, he says that farming is his hobby and he loves the nature of Nepal. While discussing the earthquake, Dhan said, “It damaged my new house which was under construction. It was a great devastation in terms of physical structure although I did not lost any member of my family. 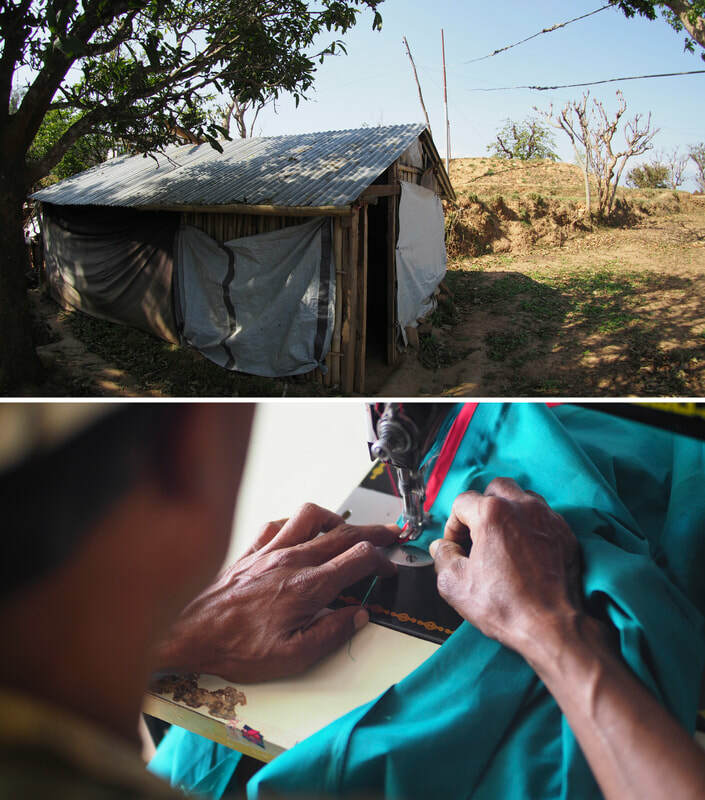 He is currently living in the temporary shelter that was built after the earthquake. 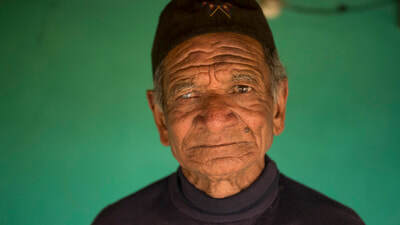 His mother went blind a few years ago and he has to take her to hospital to get treatment on a regular basis and wants to be able to support her. Bani Bahadur Shrestha (83) is a humble and enthusiastic man whom grew up in the lap of Mount Manaslu. He spent much of his life following in the steps of his forefathers farming and appreciating the natural world. “I do not like the caste system which is rooted in Nepali culture as it creates divides” and he seems focused on progress. “I like farming, doku making and enjoys doing social work. “We have experienced more drought, less rain, more hurricane and increased heat in the summer season” but he does not know about the causes of the changing climate. 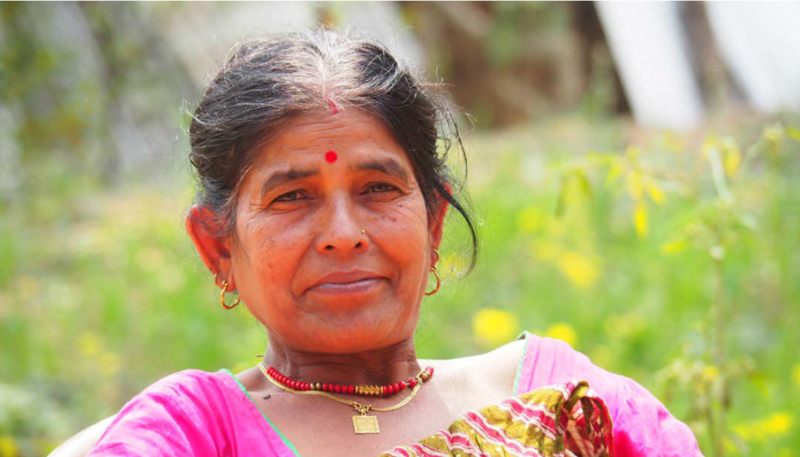 Buddha Kumari Dhakal (53) is a positive and passionate woman whom lives in Khadka Gaun. She is always happy and sells coffee and bananas in a local market. At the age of 13 she got married and had six children by the age of 30. During our work in Khadka Gaun, she attended all of our trainings and events, through SSICDC and Raleigh International; she was one of our entrepreneurs that we helped develop her business growing coffee and bananas. 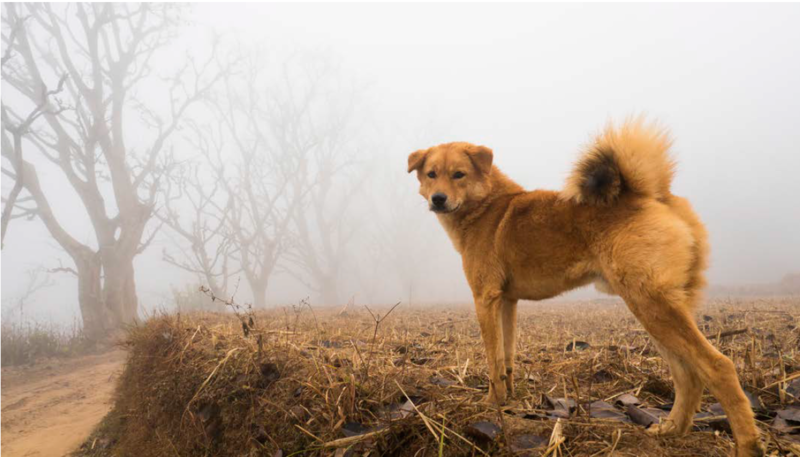 Growing up in the lap of Mounta Manaslu in Gorkha, she appreciates the natural world and loves animals. “I have always been a great lover of nature and my country is rich in natural beauty, that is why I like to visit different areas”. 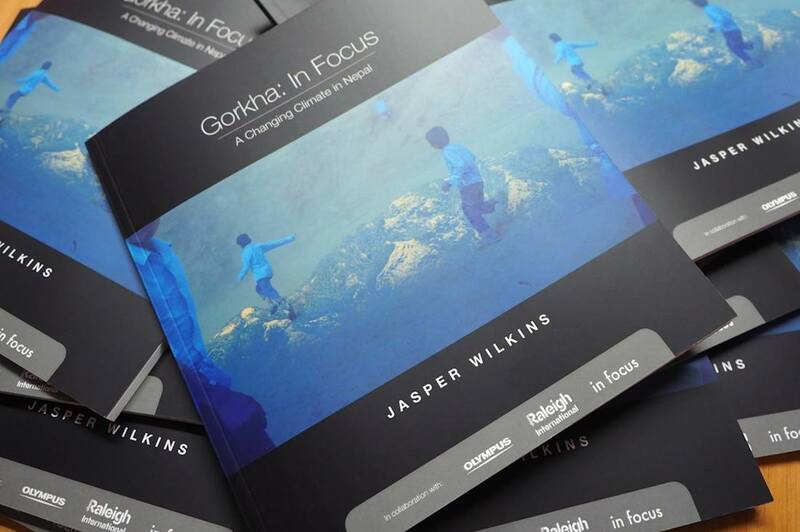 Gorkha: In Focus Book by Jasper Wilkins. Funds go towards environmental causes/community of Khadka Gaun. Email us at infocus.org@gmail.com if you want a copy. ​Jasper Wilkins is an Olympus Ambassador and documentary photographer passionate about the environment and the natural world, sharing stories across the world of beauty and hope. 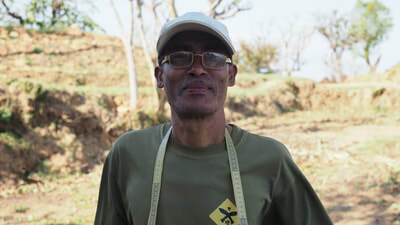 Working as a team leader in Khadka Gaun, Gorkha, Nepal he spent time with an inspiring community with a team of volunteers to provide livelihood development and adaptation for the people. Raleigh International is an organisation working to create impact through youth, working in countries such as Costa Rica, Tanzania and Nepal. Young people are the future leaders, engineers, artists and change makers of tomorrow and International Citizen Service offers an unique experience for 18-25 year olds to learn through cross cultural collaboration, working on important issues such as water sanitation, education and climate change. Photography by Jasper Wilkins. Email us at infocus.org@gmail.com if you have any questions about this project or want to purchase prints/books. We look forward to hearing from you.